I recently asked some my followers on Instagram for ideas of new posts they'd like to see from me, and one of the responses surprised me - 'How to stay positive and motivated'. I'm one of those people that bottles things up, and am definitely guilty of 'putting a face on'. So I'm not going to lie, I found sitting down and thinking about a subject like this tough. Although it still seems to be a taboo subject, I'm not ashamed to admit I've suffered with depression and anxiety in the past. However, when a family member told me about a Ten Day Positivity Challenge they were setting themselves I initially dismissed it, but have actually found to be surprisingly helpful. 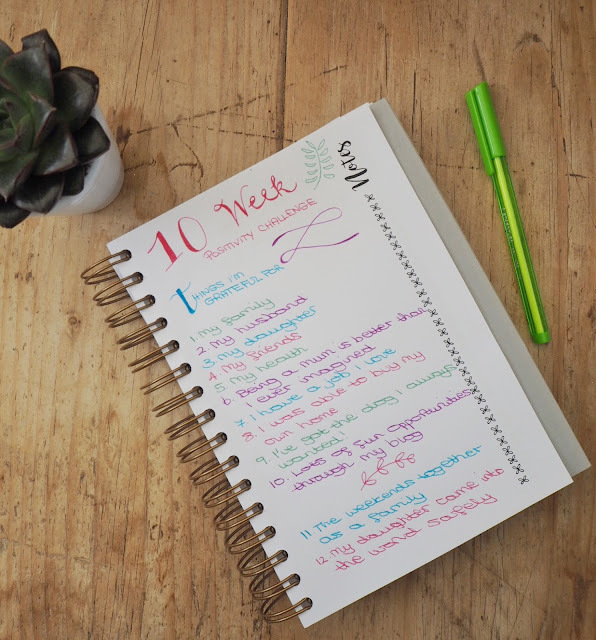 It simply involves jotting down ten things every day that you're grateful for - it doesn't matter how small. Once you've completed ten days you should regularly read back your list of 100 things, which works to remind you of how lucky you are - something which I think can often be hard to see. Being a fairly negative person by nature, I found it to be quite a hard task to start with, but once I got into it, I came up with more and more things I love about my life, reasons to be incredibly grateful, and things that I often overlook. I think motivation by nature, can be hampered by feeling negative - the first thing to disappear when you're feeling down is always your 'get up and go'. I've previously written about why I started blogging in the first place, and while I'm not going to lie, it was predominately a love for banging on about cushions, I've found a bit of a solace in blogging. I find having an outlet like this to be a great 'pick-me-up', which in turn keeps me motivated. Motivation for me is about finding something you love, and blogging is definitely my 'thing' (also why exercise has never worked for me!). When I've had a long day and all I want to do is slob out in front of the TV, I know opening my laptop and typing away, even for just 10 minutes, will give me a little boost. What keeps you motivated? Have you taken on any mental health challenges that you would recommend? I'd love to try some new ones!